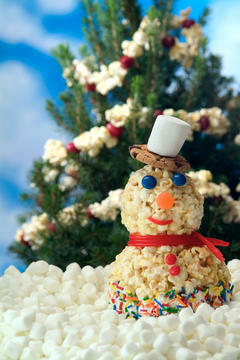 The recipe for this delicious holiday treat comes from the Popcorn Board, which offers all kinds of information about popcorn, from trivia and coloring pages for kids, to great recipes. * Decorations: sprinkles, licorice, gum drops, cinnamon candies, etc. 1. Melt marshmallows and butter in a large saucepan. 4. Pour over popcorn and stir. 5. Butter hands well and form into balls.